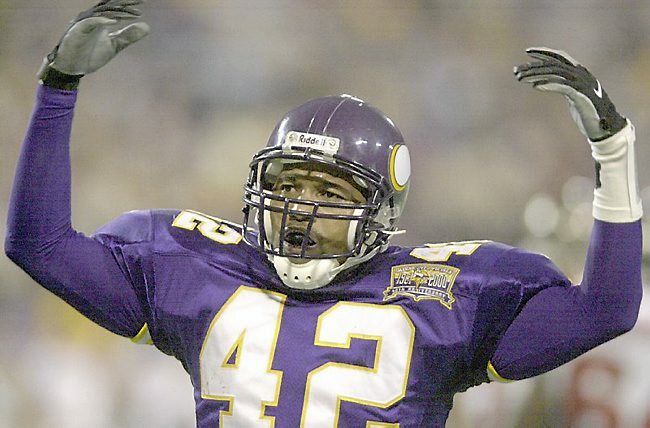 Orlando Thomas, former Minnesota Vikings safety died yesterday at age 42 following a 10-year battle with ALS, also known as Lou Gehrig’s disease. He was living in his hometown of Crowley, Louisiana, a short half hour away from the University of Louisiana-Lafayette campus where he had been a four-year starter for the Ragin’ Cajuns. Selected in the 1995 NFL draft, he led the league with nine interceptions in his rookie year and played his entire seven-year career with the Vikings as a key starter. He retired after the 2001 season at age 29. A Vikings team statement yesterday said they were deeply saddened by the loss. “Orlando was an outstanding player for the Vikings for seven years, but more importantly, he represented the franchise and the state of Minnesota with the utmost dignity and class. The statement also praised his outgoing personality and community involvement that made him a player favorite as well as a community favorite. For all of you who did the ALS ice bucket challenge, here’s hoping the money you helped raise for ALS research will prevent others from contracting and dying from this disease!